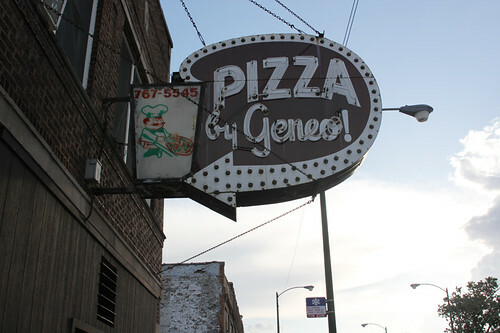 Nice to see some love for Geneo’s, they have another location same sign and all way down South on Halsted in Harvey down the block from the Hells Angels Place. Interesting strip there 🙂 Not great-great pizza but def old school atmosphere. I saw references to that but couldn’t tell how likely it was to actually be related. 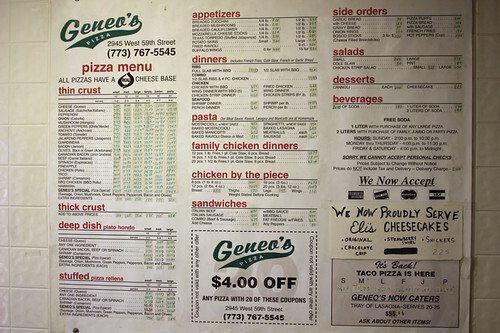 Rene G has canvassed this area, because a lot of old-school pizza parlors moved to the southern suburbs and into Indiana during the late ’60’s. You might want to ask him about it. 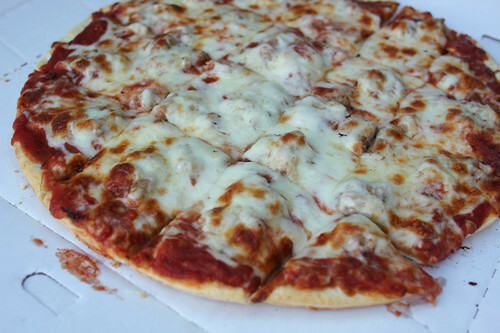 Try Villa Nova Pizzeria at 6821 W. Pershing Road in Stickney. Dan Zemans did a very nice review about Villa Nova on Slice Serious Eats a little while back. I still think Villa Nova is the best thin crust pizza with homemade sausage anywhere, with Pat’s a very close second (very close). The only real difference between Pat’s and Villa Nova is that Villa Nova uses larger hunks of sausage on their pizza than Pat’s. And their housemade sausage is the best in the business. 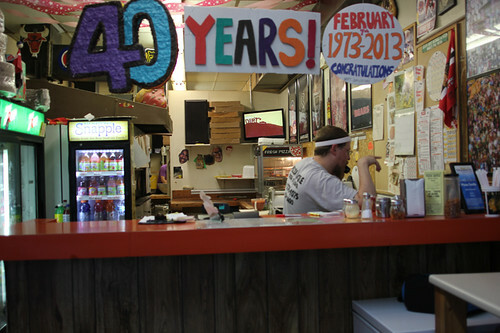 Zemans took some nice photos of Villa Nova’s pizza for his Slice review. I’ve always thought Villa Nova was better than Vito and Nick’s in every category. 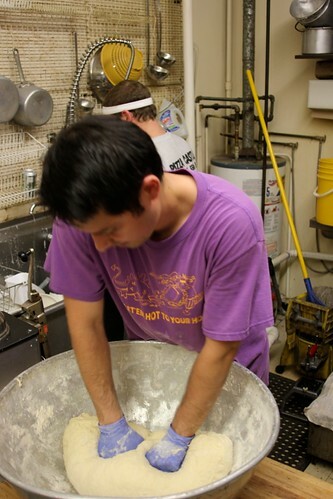 And that’s not a knock on Vito and Nick’s because Vito and Nick’s makes a great thin crust pizza. I just think Villa Nova’s pizza is better, along with Pat’s, and Joe’s Italian Villa (also reviewed on Slice) in Bridgeview. All 3 of these places have better homemade sausage recipes than Vito and Nick’s. Thanks, yeah, we were actually talking about Villa Nova while waiting at Geneo’s, and Zemans remains a big fan. 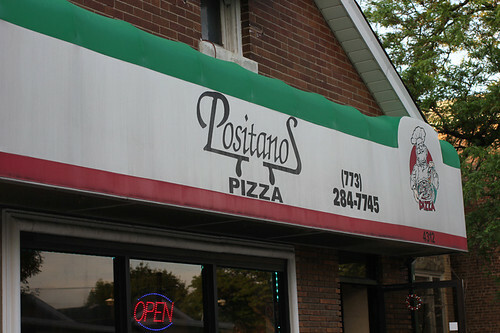 I think the near-in suburbs, with a lot of pizza places that date back 30 and 40 years, are definitely another fertile territory for exploration– there’s a ton of places around Park Ridge, for instance, and who knows which of them might be standouts? And I’m sure that’s true of many west and southwest burbs that don’t get a lot of foodie attention. When it comes to pizza close to Park Ridge, I like the new Romano’s in Rosemont at 9785 W. Higgins. They have a full bar, too. Very old school, and they moved from their old location in Des Plaines to this new location in Rosemont. They’ve been around for over 60 years. The simple cheese and sausage will do here, too. The owner is usually there, and he cuts the pizza in rectangles, instead of squares, which is kind of odd, but it’s very good. 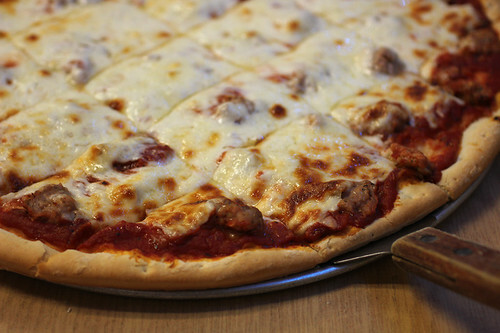 There are some nice photos of a classic Romano’s pizza over at Smokin Chokin Chowin With The King’s blogspot from a few months ago. 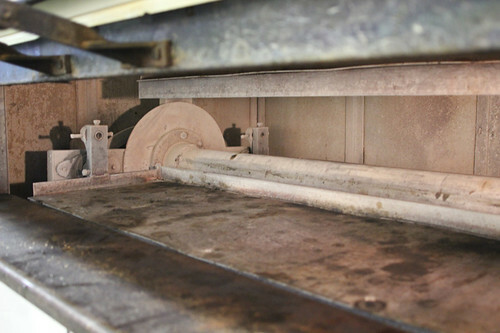 OFF TOPIC: Tell Dan Zemans to come back to Serious Eats Chicago and defend Lou Malnati’s from time to time. I think I’m one of the only Lou Malnati fans over there, and I know Zemans is a big Malnati fan, too. It’s as if the writers over there don’t want to ever give Lou Malnati’s any credit for anything. Then again, I get the sense that many of their writers are not really from Chicago. They are transplants, but they did not actually grow up here, so maybe deep dish pizza is lost on them. They are always talking about places like Coalfire, Piece, Spacca Napoli, Pizzeria Nella, Nellcote, and the late Great Lake. Yeah, those are all great pizza places, but none of them are of true Chicago origin. 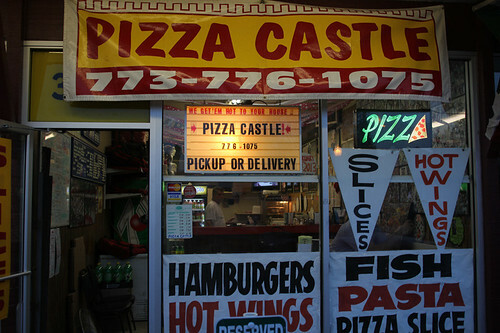 I guess if you didn’t grow up here, then these types of pizza places would appeal to you. The problem is that these writers over at Serious Eats Chicago are ignoring the very obvious: Your average, everyday Chicagoan loves Lou Malnati’s. And most of their locations are out in the suburbs far away from where the tourists eat downtown. 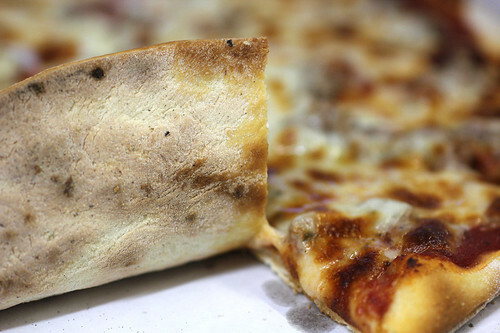 These are homegrown Chicagoans and suburbanites who adore this pizza. They didn’t become the most consumed and most popular deep dish pizza restaurant by making bad pizza. But Serious Eats Chicago sure goes out of their way to emphasize these “other” non-Chicago pizza places. The end result is that they come off as real snobs. Even worse, they come off as snobs that are not even from Chicago, but yet they want to tell everybody what constitutes great pizza in Chicago. That would be like me going to Alaska and telling Alaskans where to get the best Alaskan King Crab or going to NYC and telling New Yorkers where to get the best salami on rye. Entire generations of Chicagoans have been eating deep dish pizza and will always eat deep dish pizza. These writers for Serious Eats Chicago need to be reminded of that, so tell Dan Zemans to get back over there and defend deep dish pizza from time to time, especially Lou Malnati’s. I guess I really should just stick to LTHforum for true Chicago foodie talk. 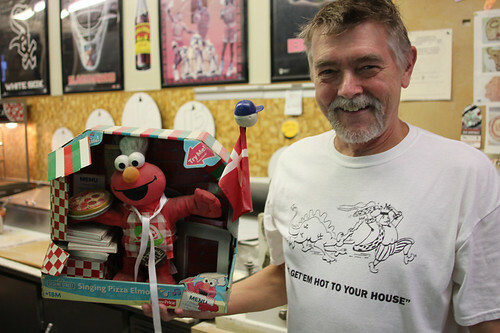 Some of the lead moderators are still huge Pizzeria Uno fans as they should be, even though they don’t talk about Uno’s that often. Uno’s (and especially Pizzeria Due) still makes great pizza, even if it’s not popular to talk about them compared to other trendier places. Zemans himself did a nice review of Pizzeria Due for Serious Eats Chicago. 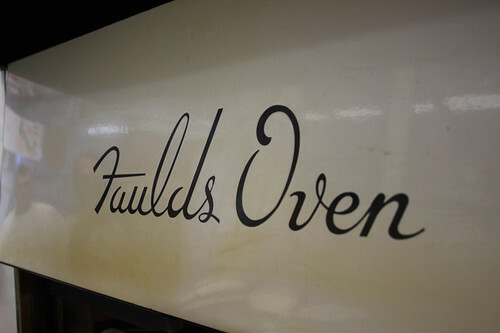 It was refreshing to see an old school deep dish place get some praise. Even if you disagree with me, I like your blog spot. Keep up the great work. You know, I’m less of a deep dish fan than I once was, but it’s worth noting that when people visit from out of town, that’s what they want here. I took my sister and her family to Spacca Napoli and you could see palpable disappointment that their one Chicago pizza slot had been wasted on something they could have at home, and not the orgiastic pizza experience they’d been dreaming of. Don’t come between a tourist and their Chicago deep dish. Thanks, Mike. You’re absolutely right about people from out of town wanting deep dish pizza. The first place every single one of my friends and family want to visit when they come home is always Lou Malnati’s for deep dish pizza, and then Johnnie’s Beef in Elmwood Park for a combo with Italian ice. Like I said earlier- the vast majority of their locations are in the suburbs where tourists don’t go. The people that frequent these locations are Lou Malnati regulars who grew up on Lou Malnati’s and Chicagoans who come home from somewhere else to visit family/friends. The majority of people who eat downtown at Uno’s and Due are indeed tourists, but the majority of people who eat at Lou Malnati’s are actual Chicagoans and/or suburbanites. For this reason, Lou Malnati’s is a true Chicago treasure due to the sheer amount of born and raised Chicagoans who actually eat there.